Meeting OfSTED: The Game has Changed. The Headteachers’ Roundtable Meeting. Click to follow the link. 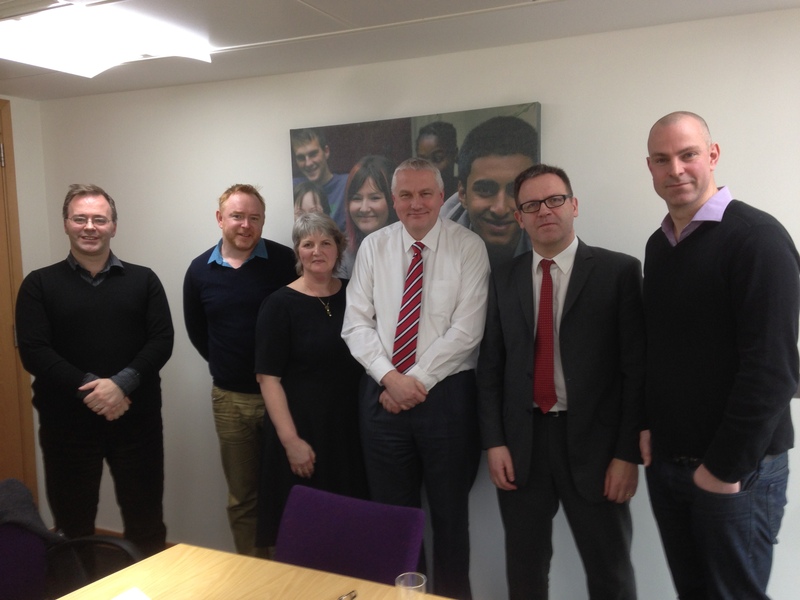 The Headteachers’ Roundtable meeting at the DFE emerged out of discussions with Michael Gove last summer; it was something we’d been working towards for months. The meeting at OfSTED was entirely different. Two weeks ago I received an email from the OfSTED communications team inviting me to the meeting on the basis of ideas I’ve expressed on this blog. Evidently, there is a recognition at OfSTED that the twitter-blog world has something to offer in terms of two-way communication. Arriving at this meeting, none of us knew who else would be there and we were all attending as individuals, not representing anyone. However, in writing this – as David and Ross have done – I suppose we are playing a small part in helping to convey how some people in the profession feel and helping OfSTED to communicate their thinking. What we found was that, behind the slightly frightening OfSTED Wizard of Oz facade, there are real people trying to do good. Our visit had parallels to this one. I won’t say which of us is which.. The OfSTED Game Has Changed. Lesson Observation Grades Are Over. Officially, this isn’t news. It’s been implied in the new framework for a while. However, for various reasons, the message has not been getting across. There are still elements of the written guidance that have yet to be fully aligned and, naturally enough, there are inspectors who have not fully taken on board the significance of the guidance. Mike Cladingbowl has been updating guidance to inspectors to make this more and more explicit – with evident frustration at how difficult this has been. In our meeting with Mike Cladingbowl he was absolutely explicit about this. Inspectors should NOT be arriving at judgements about individual lessons. 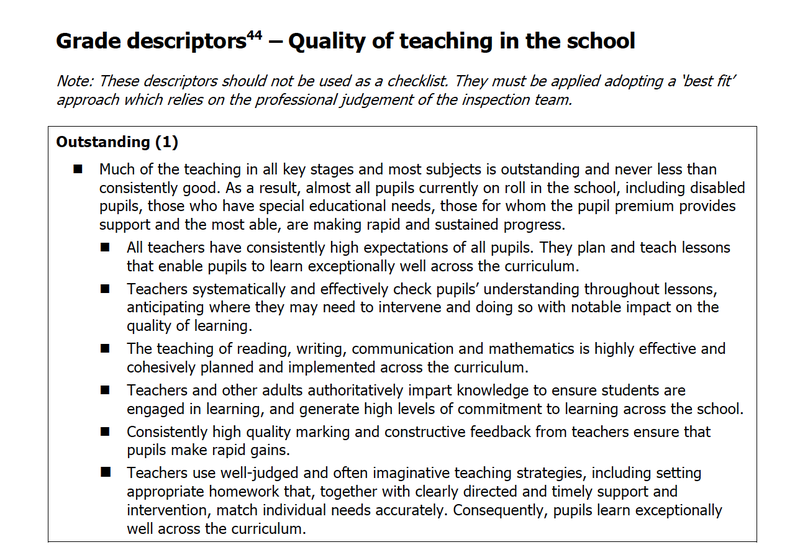 They should NOT be telling teachers or the Headteacher that any individual lesson was RI, Good or Outstanding; they should NOT even be writing a grade on their Evidence Form. Why? Because the grades are a best fit of all the evidence they can gather about the overall quality of teaching in a school and this very explicitly IS NOT the aggregation of the grades of individual lessons. The fact that we are not already fully aware of this and acting on it is because too many inspections are promoting the view that grading, de facto, still does exist. However, Mike Cladingbowl is determined for this to change. He is urging schools, Heads, teachers to let them know directly when grading of individual lessons still occurs. He could not have made this any clearer. So, I’d suggest that we take him at his word and act on this. Once we reach a point where people across the system actually trust that this is the new reality – in practice as experienced in actual inspections as well as in the content of the latest OfSTED guidance – the consequences are significant. School leaders and Governors will need to re-evaluate their internal accountability processes. If schools are still grading lessons or, worse still, are using grading of individual lessons to inform PRP judgements, they will need to think hard about what they are doing. 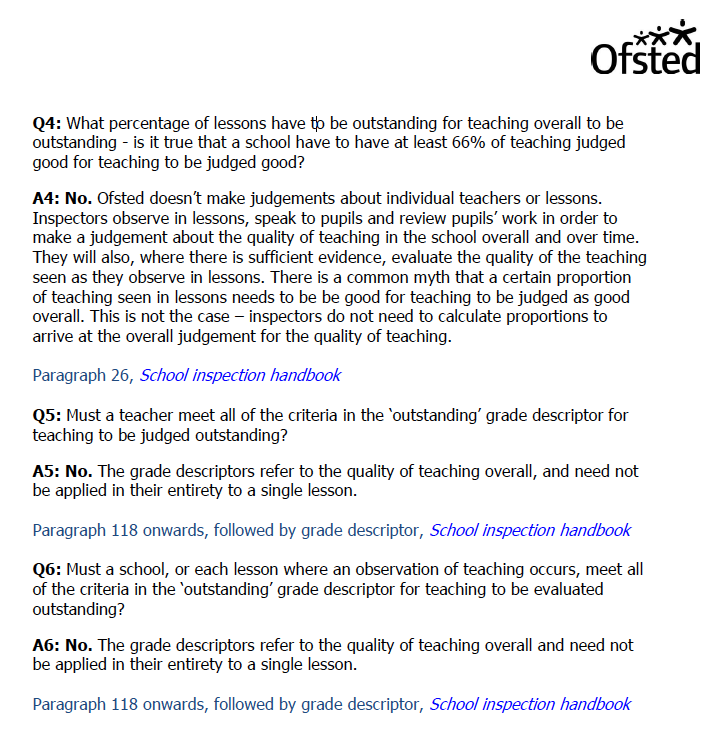 Every teacher and every governor or member of an SLT should be crystal clear that there are no OfSTED-defined lesson grade criteria. If a school is going to persist in giving grades, those grades will need to be defined locally – with a rationale that is not ‘because that’s what OfSTED say’. They don’t. Not any more. All talk of the ‘OfSTED Outstanding Lesson’ will need to stop; it is not meaningful and hasn’t been for some time. No teacher should have to say “I got a 2” or “I was RI” in their latest observed lesson – not if that is meant to refer to OfSTED criteria. Things are going to have to change. However, hopefully what will emerge is a stronger professional culture rooted in a more intelligent understanding of what ‘Outstanding Teaching’ means for an individual and across a whole school and what the evidence for this might look like. The process of evaluating a teacher’s performance will now have to be developed throughout the system through explicit triangulation of multiple evidence sources gathered over time, without reference to OfSTED grades for individual lessons. This has got be good news for so many reasons. There is so much inertia in the system, it will take a while for the fresh air to circulate into every corner, but, make no mistake, the game has changed. I know people who will want to wait and see – they won’t trust it, not for ages. But, I’m convinced that this is the real deal. Step outside people; breathe it in; it’s a new dawn… Scarecrow has a brain! It seems to me that this is the direct we’re heading in. Bring it on Mike. That’s the way to go. Ditch all the grades – it’s just too confusing. Meanwhile, SLTs around the country, you know what you have to do! UPDATE: See this post: Keeping Up with OfSTED’s Goalposts. What SLTs should do. I have recently been observed and been given a2c grade supposedly good but only just. We have all had one observation last half term as well. From the new year until July we will receive 4 more observation s . We are all expected to increase our levels for example I am expected to go up to 2a. Next week we will be having a work scrutiny which will also be graded. These observations have been called “learning walks” but total preparation is expected. We are given a day when we will be observed and not a time so mine was any time on Thursday . I work in a special school moderate learning difficulties. Everyone in school is exhausted and morale is rock bottom. Are the senior leaders allowed to treat their staff in such a decisive and demeaning way? These people are idiots; totally deluded. Write to the governors and tell them. It’s sounds very unhealthy to me. Learning walks are a normal part of school life but there needs to be some trust. Unions should start taking action over grading. I feel for you. There are better more enlightened places to work.